It's not quite the same to look at your hamster and see crusty, gooey eyes staring back at you. Fortunately, if your tiny pet has an eye infection, you can help him recover fairly easily. It may require a trip to the vet, but a few simple steps will help you heal your hamster's eye infection and get his pretty peepers back to normal. There are many possible reasons for a hamster's eye infection. Those sparkly little eyes may be irritated from dust in his bedding. He may have suffered an injury or they may be responding to a viral or bacterial infection. You can try to heal him on your own by mixing a half cup of sterilized water -- water that's been boiled and cooled -- with a teaspoon of boric acid powder to use as a wash. Use an eye dropper to bathe his eye with the solution two or three times a day. A soft touch with a cotton ball soaked in warm water will loosen crusty material around his eyes. If your hammy's eyes don't improve in a couple of days, it's time for him to get acquainted with the vet. The vet may flush his eye with saline solution and provide an oral or topical antibiotic. Pain relievers are helpful for particularly irritated eyes. 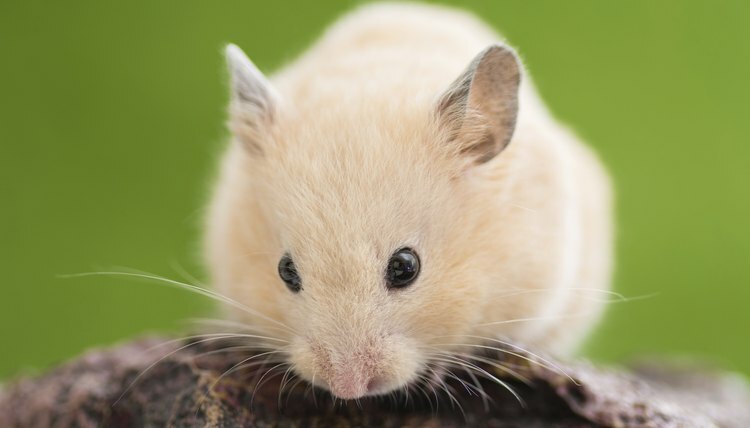 You'll likely need to clean your hamster's eyes with a warm, damp cotton ball. Take care to practice good hygiene and wash your hands after caring for your little fellow to avoid spreading the infection to other hamsters.